MMS MUSICAL BUILDERS NEEDED: Any handy parents out there willing to lend their time & talents (& tools) to the MMS Musical? We need your help! Set builders should please come to school Saturday, November 5th from 9am-3pm to help out. Any questions? Please reach out to Ms. Palmgren at rpalmgre@somsd.k12.nj.us. STUDENT COUNCIL UPDATE: Student Council’s collection for Box Tops is ongoing. Please encourage your kids to send them in to earn money for our school and earn Battle of the Classes points too. Also, please continue to send in donations for our School Store. All donations of snacks, waters, and items are welcome, and the Amazon site with specific items can be found HERE. Last, Student Council plans to start Lunchtime Raffles soon, so please consider donating a gift card. Any questions? Please contact Ms. O’Sullivan at mosulliv@somsd.k12.nj.us. MMS SPIRIT WEAR SALE EXTENDED: We’re extending our Spirit Wear sale! So there’s still a bit of time to shop online at http://www.mmshsa.org/spirit-wear.html for the latest MMS garb. Or check your student’s backpack for a flyer this week. Any questions? Just ask Lynn Salort at lsalort@aol.com. SCHOOL BEAUTIFICATION: We are resuming our school beautification work and we need helping hands! Two upcoming projects will be decorating the hallways & bulletin boards with inspirational quotes chosen by faculty & administration and taking photographs of students in the science labs to display throughout the science wing. Want to get involved with these or other beautification efforts? Please contact Karen Harris Kingsley at kharris.kingsley@gmail.com and she will put you to work! 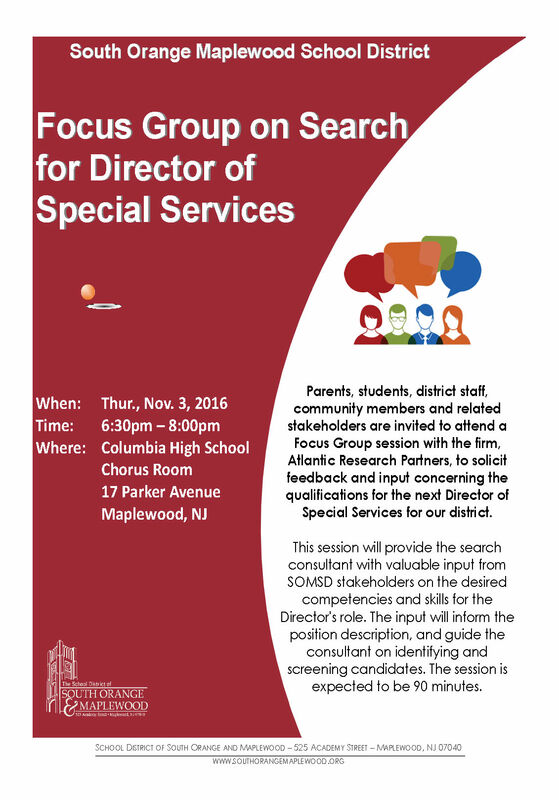 FOCUS GROUP ON SEARCH DIRECTOR FOR SPECIAL SERVICES: The search firm hired to help fill the Director of Special Services position is hosting a focus group to solicit feedback and input from the community on Thursday, November 3rd from 6:30pm-8pm in the CHS chorus room. Flyer is HERE. BOARD OF EDUCATION CANDIDATES’ FAIR: On Thursday, November 3rd Presidents’ Council will be sponsoring a Candidates’ Fair from 7pm-8:30pm in the CHS library, all info HERE. Please help our schools and our children by being an informed voter! We hope you enjoyed this autumn weekend. There’s a lot going on at MMS this coming week, so we’ll let you get to it. We urge you and your kids to participate in our first ever MMS DANCE-A-THON happening this Friday. Come out, eat from a food truck, win an iPAD, bust a move with faculty & friends, and have some serious FUN! Proceeds go to our Positive Behavioral Interventions & Supports Committee (PBIS), including our MMS School Store (rewarding positive student behavior daily). ​NO-FRILLS FUNDRAISER: So! The good news is that many of you have given to our No Frills Fundraiser and we are enormously grateful! As you know, the funds you so generously give help our students in many important ways and enrich their experience at MMS greatly. THANK YOU, THANK YOU to those of you who have contributed! WE APPRECIATE YOU!!! The not-so-good news is that we’re behind our fundraising total for this time last year. So if you haven’t given yet, we urge you to please consider a donation. We don’t want to have to cancel any of our wonderful programs for the kids. Click HERE to donate now. Thank you!! ​MMS DANCE-A-THON: Dance! Eat! Earn Battle of the Classes points! Hang out with friends! Win an iPad! C’mon, you know your students don’t want to miss all of the fun. Please encourage your kids to show up at our Dance-A-Thon this Friday, October 28th to participate and show their support for this fun, community-building event! The flyer is HERE and the registration form/permission slip is HERE. We hope to see you then! SPIRIT WEAR: The October 30th deadline to order MMS Spirit Wear is almost here. Don’t miss your chance to buy cool new MMS garb for you and your kids! Check out all the great stuff we’re offering HERE. Any questions? Reach out to Lynn Salort at lsalort@aol.com. Do it today! BOARD OF EDUCATION ELECTION INFORMATION: As we hope you know, our Board of Education has three openings this year and the election coincides with the general election (don’t let Mr. Trump trip you up on the date, it’s Tuesday, November 8th this year). Please inform yourselves on the issues and on the candidates and please vote! The decisions made by our BOE are critical to our children’s education. Please click HERE for a link to the 2016 BOE candidates’ statements on Special Education in our school district. Looking for a chance to hearing from the candidates in person? On Tuesday, October 25th the Community Coalition on Race will be sponsoring a Candidates’ Forum at 7pm in the SOMS library, all info HERE; and on Thursday, November 3rd Presidents’ Council will be sponsoring a Candidates’ Fair from 7pm-8:30pm in the CHS library, all info HERE. Show up and read up and help our schools and our children by being an informed voter! TRAFFIC AND PEDESTRIAN SUMMIT: This Summit is being held on Monday, October 24th at 7:30pm at The Woodland. Please click HERE for all of the information and to be part of the solution to this growing problem in our two towns. MMS WORLD: The first edition of the MMS World online newspaper is HERE! Check it out! 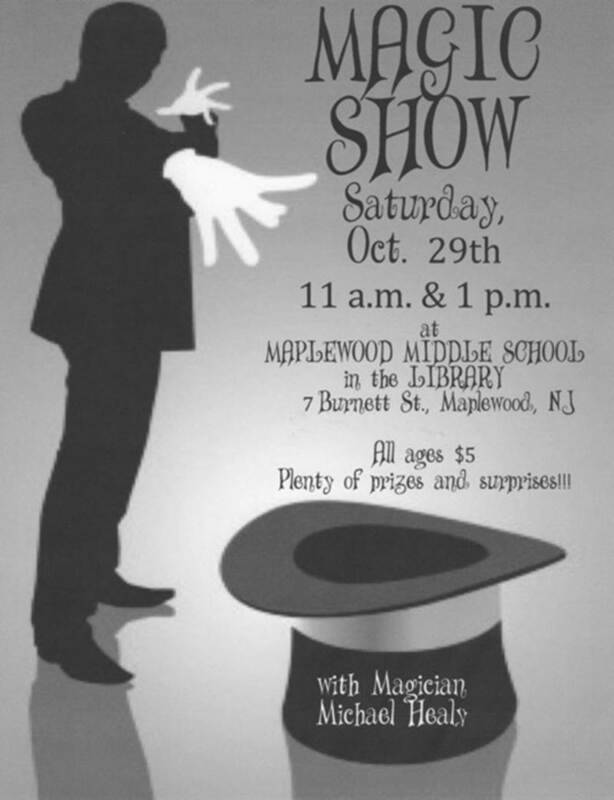 MAGIC SHOW: MMS Interim Assistant Principal and all-around magical guy Mr. Michael Healy is hosting two magic shows on Saturday, October 29th in the MMS library, at 11am and again at 1pm. All the info is HERE. Please remind your students that they may use Cougar Cash toward the price of admission! 38 MMS STUDENTS PARTICIPATE IN SPARTAN RACE: Yesterday, 38 Maplewood Middle School students exemplified grit, tenacity, and perseverance at Mountain Creek in Vernon, NJ. These individuals competed in a Spartan Race, a 2 mile endurance test where the athletes had to run up and down a mountain, but standing in their way were twelve obstacles. If they failed to complete an obstacle, they were required to perform 5 burpees as a penalty. Read more of Coach Mantes' account and see who participated here! Congrats to all who participated and represented MMS well, and THANK YOU to Youth Net for sponsoring our MMS Fitness Club! MMS Spirit Wear Store is OPEN! JUST IN TIME for your Holiday Shopping, your MMS-HSA presents our 2016-17 Spirit Wear Collection! These cool clothes not only help build school pride, but they make the perfect holiday gift for that hard-to-please tween and teen. All profits from the sale of Spirit Wear go to help pay for our HSA sponsored student programs this year! THANK YOU in advance for your generosity. Order today, as our Spirit Wear Store is only open through October 30! The grade 6 coordinators are looking for volunteers to help with the upcoming 6th Grade Fall Canteen. We will need volunteers starting October 20th. Volunteers are needed to handle a variety of tasks e.g. providing delicious treats, selling tickets for the Canteen during the 6th grade lunch or volunteering at the event. Please look at the list and signup. CLICK HERE FOR THE SIGN UP. Let's help make this a fabulous first Canteen event for our 6 Graders. Please note - Items need to be dropped off in the main office the day of the event, or you can email one of the coordinators listed below to arrange pick up. Hello MMS! What better way to pass the time on this rainy Sunday than to sit back and read the HSA eblast? Lucky for you here it is. Enjoy! SCHOOL CLOSED: MMS is closed on Wednesday, October 12th in observance of Yom Kippur. WELCOME DESSERT/COFFEE PARTY FOR MS. GRONAU & MR. PATTERSON: We hope to see everyone this Thursday, October 13th at 7:30pm in the MMS Library for a Welcome Party for our new principal, Ms. Gronau, and our brand new Assistant Principal, Mr. Patterson. Come enjoy coffee/tea and desserts compliments of your HSA as we hear from our new Principal and Assistant Principal, have an opportunity to ask questions, and mingle with fellow parents. Let’s make sure we show them our support! Please click HERE for the invitation. MMS DANCE-A-THON: It’s almost here, so SIGN UP today for this great event! The first ever MMS Dance-A-Thon is happening on Friday, October 28th and we hope you & your students will get involved for a chance at prizes and fun. The PBIS committee is meeting this week to finalize plans, so watch for an e-blast with more details about this great event. In the meantime, please book the date and sign up at the link above and know it’ll be an entertaining, community-building event filled with music by a professional DJ, dancing, food trucks, and more! SPIRIT WEAR: Spirit Wear orders are being accepted only until October 30th so don’t forget to order soon! MMS garb makes a terrific gift for birthdays or the holidays. We have lots of great new offerings plus working car magnets too. So check it out here http://www.mmshsa.org/spirit-wear.html! Any questions? Reach out to Lynn Salort at lsalort@aol.com. SAVE THE DATE FOR TRIVIA NIGHT: Woo hoo! Our largest party and fundraiser of the year is booked and it’s going to be better than ever. So please save the date Friday, February 3, 2017 for MMS Trivia Night at The Woodland! Go ahead, do it now. You won’t want to miss it. SCHOOL STORE & LUNCHTIME RAFFLES: The School Store is booming, thanks to all of you! Please keep up the donations of snacks, waters, and items -- the kids are loving it! A vibrant store helps make the Cougar Cash reward system meaningful for our students. All contributions are welcome, and the Amazon site with specific items can be found HERE. Also, Student Council plans to start lunchtime raffles soon, which are another terrific incentive & use for Cougar Cash. Parents can donate gift cards to stores/restaurants in town and the students will raffle them off at lunchtime. Have a gift card to donate? Send it to school with your child with attention to Student Council/Ms. O’Sullivan. And thank you so much for your help with our Cougar Cash program! 6TH GRADE SOCIAL: The 6th grade Fall Social is always the best-attended event of the year and your 6th grader won’t want to miss it! It’s the perfect way for your students to get to know their new classmates in a fun setting. There will be food, dessert, a DJ, games, and more! Save the date Wednesday, October 26th. More info and permission slip to come. A SPECIAL INVITATION TO 7TH & 8TH GRADE MUSICIANS AND THEIR PARENTS: See what it's like to play in the CHS Marching Band, the Pride of Columbia! On Saturday, October 15th all MMS and SOMS 7th and 8th grade musicians are invited as guests of the CHS Marching Band to play during the rehearsal and home football game versus Seton Hall Prep. That morning, you'll see what it takes to put on a field show, rehearse our stands music, and meet your "big sisters and brothers" in the band. Starting at 1pm MMS students can play in the stands during the game and have a field-side seat for the halftime performance. (Parents -- plan to be there to cheer on the kids.) This free event includes lunch and a third-quarter snack. Sign up here: http://www.somsd.k12.nj.us/Page/2936. See you Saturday, Little Cougars! MAPLEWOOD LIBRARY CLEAN SLATE PROGRAM: During the month of October, students in grades K-12 with a Maplewood Library card can have their overdue fines waived. Come in person to the Main Library or Hilton Branch and start with a clean slate! Middle School students see the Teen Librarian for assistance. Ms. Gronau would like all of us to know that she very much looks forward to meeting & addressing everyone at Thursday evening’s welcome party -- see you then! Calling All 6th Grade Students & Parents: Mark Your Calendars - The 6th Grade Social Is Coming To MMS! ​Please Be On The Lookout For A Signup Genius That Will Ask For Assistance In Creating This Fun Activity For Our 6th Graders. SCHOOL CLOSED: MMS is closed Monday, October 3rd and Tuesday, October 4th in observance of Rosh Hashanah. Happy New Year to all of our families who celebrate! OPEN HSA MEETING: Please save the date Thursday, October 13th at 7:30pm in the MMS Library. Your HSA will be hosting a Meet & Greet with special guests Ms. Gronau, Mr. Brown, and our new Assistant Principal Mr. Patterson. Please come enjoy complimentary coffee & desserts at this reception for our new MMS Administration! Ms. Gronau will present on a few topics of interest and also will conduct a Q & A. This is a terrific opportunity to mingle with fellow parents and chat with our incredible staff. We hope you’ll join us as we welcome Ms. Gronau and Mr. Patterson to our MMS family! Want to contribute your favorite dessert to the event? Please contact our volunteer coordinator Val Frost at vfrost3656@gmail.com to offer your baking (or purchasing) prowess! Thank you. SPIRIT WEAR: MMS Spirit Wear is back! With a fabulous online purchasing option and new items to choose from, we’ve made showing school spirit easier than ever. We are even offering new car magnets that will actually stay on your car! Check it out and shop today: http://www.mmshsa.org/spirit-wear.html. We’re accepting orders until October 30th and all items will be delivered to school the week of November 7th. Any questions? Please contact our extraordinary Spirit Wear chairs, Lynn Salort at lsalort@aol.com and Thea Cogan-Drew at theacogandrew@gmail.com. SCHOOL STORE: We love our school store because it offers tangible rewards for positive student behavior. Our kids love it because it’s got lots of great stuff! There are many ways you can help to keep it stocked and encourage our students: (1) Visit the Amazon wish list for easy ordering and delivery: https://www.amazon.com/gp/registry/wishlist/2XWAR0OJ0D1H8/ref=cm_sw_su_w; (2) Purchase snacks, waters, or fun items on your own and deliver to the Main Office (ask your kids what they really want to see in the store! ); (3) Give a small monetary donation and your HSA will do the shopping -- either cash/check in an envelope marked “HSA/School Store” or use our No Frills PayPal link and write “school store” in the notes section: http://www.mmshsa.org/no-frills-2.html. Thank you! Your contributions are so appreciated by the kids and will help keep our Cougar Cash program vibrant and meaningful. SIXTH GRADE FIELD TRIP: 6th graders have a field trip coming up to the South Mountain Reservation! The permission slip is due on Wednesday, October 5th. You can find it HERE. MMS DANCE-A-THON: We hope you’ve all saved the date Friday, October 28th for our first ever community-wide Dance-A-Thon! You won’t want to miss this fun event! Something for everyone: dancing, music, mingling, food trucks. All are welcomed and encouraged to participate! More info on how you & your kids can get involved can be found HERE. Please click HERE for this week’s message from Ms. Gronau, announcing the hiring of our new Assistant Principal!